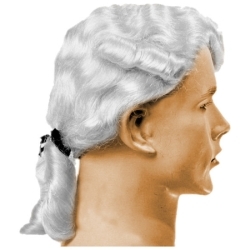 The aristocratic colonial man wig is a white colonial style wig with a pig tail and side curls and is perfect adding the finishing touch to any colonial period costume. This wig is perfect for an older George Washington or Thomas Jefferson. The wig is theatrical quality and with proper care and storage will last you for many production runs. Wig is one size fits most adults using an elastic sizing band on the inside of the wig.